Happy (almost) Thanksgiving, and welcome to the November 2014 Mystery Chocolate Box! If you remember from the email announcement we sent out, we did things slightly differently when selecting the bars to include in this box. Any ideas? It might become more apparent when we find out what the bars were. We just launched our Christmas specials so you can spread the cheer of Mystery Chocolate Box to your friends and family, and enjoy your boxes together! So the elves took all the air time that we have available for “pre-chocolate-bar-reveal nonsense”. That means we have to tell you what the bars in the November 2014 box are now. First impression: smell. It smells very “raw” and chocolatey — you can tell there’s no junk inside this bar. When you bite into it, you think it’s going to taste bitter at first, but then the sweetness hits you as it washes over your taste buds. Then, when you think it’s all over, you get the spicy kick at the end. A very interesting bar that makes you want to eat more and more just to experience the sweet/spicy sensation again. This is a very healthy bar, and one that you can eat without feeling any guilt — it’s actually good for you! It contains very few ingredients (that means no added junk), 6 grams of fiber, and only 8 grams of sugar per serving. Sweet with a spicy kick, this is a great winter treat… and it’s actually good for you! This is one bar that we’ll be keeping on hand to snack on. 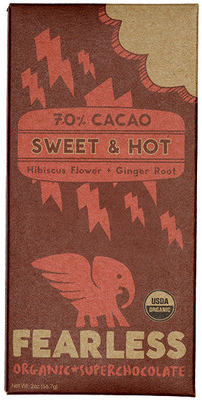 Fearless Chocolate does a whole song and dance about their chocolate, but it basically boils down to this. They grow some of the best 100% organic cocoa in Brazil, process it to perfection, and distribute it to people like us to “fuel your bold lifestyle”. So, do something bold after you eat this chocolate. If you went through your first 3 or 4 pieces of this bar before realizing what happened…. let’s just say you’re not alone. There isn’t much to say about this bar other than it’s delicious. And, smooth, creamy milk chocolate. Venchi is an Italian chocolate company, which means it is manufactured by people using only their feet. Why? Ok, ok, kidding about that. Well, maybe not the wine part. But, anyway, Venchi was started in the 1800s and makes amazing chocolates, as you can now tell by Bar B. That’s all we’ve got. This bar is definitely milk chocolate, but there’s a crunchiness inside, and it’s kind of buttery. Delicious, but what is it? We thought this bar was amazing, although we would have liked to taste more caramel — the butterscotch seemed to dominate. 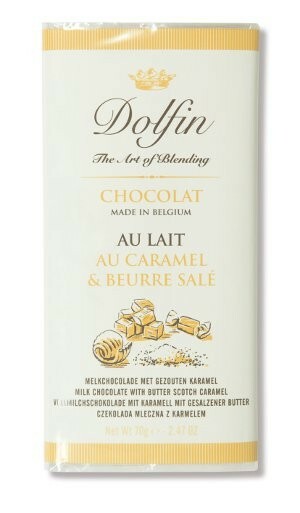 Dolfin is a Belgian chocolate company. Fun fact, they’re Belgium’s first CO2 neutral chocolate company, which means chocolate companies are going to save the world (forget the governments and fancy organizations). That’s it for November 2014! So, what do you think we did differently with the bars in this box? And, how did you like the bars? Were you able to guess them all? 3 Replies to "November 2014 Box Revealed!" Sad I missed out on these… They sound soooo yummy!!!! November’s box was my first…you guys are awesome and I look forward to my December box!!! Thanks.